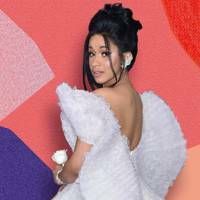 Watch your back, Kylie Jennner, Tom Ford has just released a lipstick inspired by Cardi B - and it's sold out in less than a day. Cardi reposted an Instagram photo from Tom Ford Beauty showing off the latest shade, which comes in a not-so-subtle cobalt blue, in tribute to her iconic bold makeup looks and style. Blue lipstick isn't quite the easiest colour in the world to pull off, so we didn't expect fans to go quite so wild... but in less than a day, she's posted again to say the new favourite has already sold out - even though there's been backlash from Nicki Minaj fans (for obvious reasons). Cardi is one of the latest Tom Ford celebrity namesake colours — the Boys & Girls collection has featured shades named after celebrities, such as Dakota, Drake, Gal, and Armie The cobalt shimmer is by far the brightest shade in the collection and is likened to Cardi's hair at the Broccoli City Festival earlier this year. Cardi has also teased that this isn't going to be her last dip into makeup as she captioned the original post: "So excited for this and what's to come!!"